Order - Destroy this event to begin combat or an engagement involving your personnel. If you win, score 10 points and randomly kill an opponent's personnel involved. "All I know is that the Vorta say to do something, and you do it. ... Because if you do not, they will send in the Jem'Hadar, and then you die." Characteristics: combat, engagement, kill opponent's personnel, score points, plays in your core, Assault, Maneuver. Card logging info: Logged by openCards team at Jan 1st, 2008. 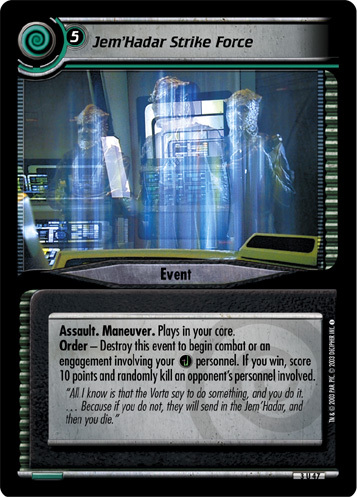 There are 7 entries for Jem'Hadar Strike Force (ST2E 3 U 47) at the Tradeplace (5 haves and 2 wants). Click here to see all trade list entries for this Uncommon card! Also see here for all trade lists with any card fom "Call to Arms".